How to Update Apple iPhone to iOS 8 Easily and Safely? How to Update iPhone 5S/5C/5/4S to iOS 8 Easily and Safely? It is reported that Apple has officially stopped code signing iOS 7 for iPhone and other iOS devices to make way for the new iOS 8. So, updating iPhone, iPad and iPod Touch to iOS 8 is only a matter of time. iOS 8.0.1 is reported to make iPhone users fail to make calls or use Touch ID fingerprint sensors. Fortunately, new iOS 8, namely iOS 8.0.2, is released timely to fix the bugs. So, it is suggested to download the latest iOS 8 version and install it on iPhone 6/6 Plus/5S/5C/5/4S. How to Play DVDs on iPhone Running on iOS 8? Rip any regular and commerical DVDs to iPhone and other iOS devices playable formats on Mac and Windows. Is Your iPhone Compatible with iOS 8? Before updating iPhone to iOS 8, you should check whether your iPhone is compatible with iOS 8. iPhone models compatible with iOS 8 include iPhone 4S, iPhone 5, iPhone 5S/5C, iPhone 6 and iPhone 6 Plus. 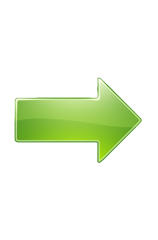 Other iOS devices that can work with the new iOS 8 contain iPad 2 and later and iPod touch 5th generation. That is to say, only iPhone 4 is removed from the list. So, if you're an iPhone 4S user or newer iPhone owner, you can freely upgrade iPhone to iOS 8. How to Update iPhone to iOS 8? This part will introduce two ways to update iPhone to the latest iOS 8 software: update iPhone to iOS 8 on iPhone directly and upgrade iPhone to iOS 8 over iTunes. Step 2. Check if you have enough storage space for iOS 8 upgrade. If not, please delete some files firstly. This update requires about 5.8GB of storage space to temporarily store the download during update process, although iOS 8 will only occupy 1.1GB on iPhone. Step 3. Click on Settings > Scroll download to General > hit Software Update > download and install iOS 8. Step 4. Restart iPhone after finishing the above steps. This method surpasses the first one because you don't need to delete things on you iPhone for iOS 8 upgrading. But before using iTunes to update iPhone to iOS 8, please verify if you're running on the latest iTunes edition. After getting newest iTunes ready, please begin iOS updating by following the steps below. Likewise, it is necessary to back up your iPhone to iTunes or/and iCloud. Step 1. Connect iPhone to your computer. Once iPhone is detected by iTunes, move to the next step. Step 2. Click Check for Update instead of Restore iPhone button to see if iOS 8 is available for your iPhone. Step 3. Download and install iOS 8. Since the download will go into your computer, you don't need to erase files in your iPhone to make space for iOS update. As you can see, both the ways to upgrade iPhone to iOS 8 are very easy to handle. After finishing iOS 8 updating, you can enjoy the amazing iOS 8 features, such as, share files with different apps, execute time-lapse photography, and answer calls from your computer. Powerful as iOS 8 iPhone is, you can also add an extra feature to enjoy better user experience on iPhone – play DVD movies on iOS 8-based iPhone. Needless to say, iPhone is an ideal player. But iPhone itself is not available to play DVD movies. To play DVD movies on iPhone running on iOS 8, all you need is a professional DVD ripper like WinX DVD Ripper Platinum. It is a popular DVD ripper capable of ripping any DVD to common video formats compatible with iPhone 6/6 Plus/5S/5, iPad, Apple TV, Samsung Galaxy Note 4/Edge/S5, HTC One M8, WP8, Xbox, Chromecast and more devices. It can easily bypass all copy protections and rip latest DVDs, like Transformers: Age of Extinction, Captain America: The Winter Soldier, The Amazing Spider- Man 2, Jack Ryan: Shadow Recruit and Frozen. High Quality Engine and Deinterlacing guarantee that the output files are in good quality. And the support for Multi-core CPU ensures that DVD ripping can be finished at super fast speed which is proved to be x2 faster than other rippers in the market. Follow the guide to play DVDs on iPhone which has been updated to iOS 8. Firstly, please download and install it on your computer. And then launch it to begin. Step 1. Load DVD (or ISO image file/DVD folder). After loading the DVD and automatic title selection, the output profile window will pop up. 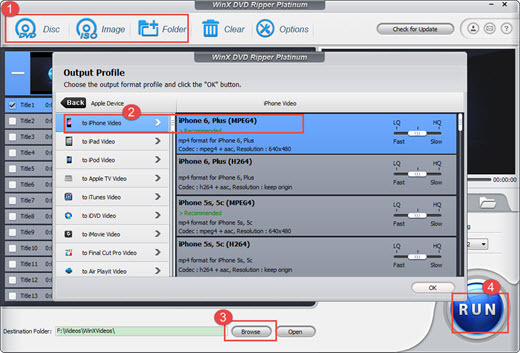 To play DVD movie on your iOS 8 iPhone, you can follow directory Device Profile > Apple Device > to iPhone Video > iPhone 6, Plus. Step 3. Choose a folder to save the video file ripped from DVD disc. Step 4. Hit RUN to begin DVD ripping. Once completed, please transfer to iPhone for playback. Actually, no matter you update iPhone to iOS 8 or not, you can use WinX DVD Ripper Platinum to rip any unencrypted and copy protected DVDs for DVD movies playback on iPhone 6S/6/5S/5/4S/4. But it is worth noting that the software provider only advocates ripping DVDs for personal use and suggests referring to the DVD copyright laws in your countries beforehand. If you want to play DVD on iPhone 6, iPhone 6 Plus, iPad, Apple TV, Android phone/tables, PSP/PS4 etc. mobile devices, please try WinX DVD Ripper Platinum! How to Rip/Convert DVD to iPhone 6/6 Plus Phablet? How to Play YouTube HD Videos on iPhone 6? 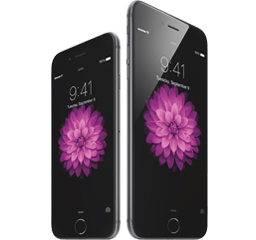 How to Convert HD Videos MKV M2TS to iPhone 6?